The idea behind Deterministic Periodic Flow (1963) – large numbers of identical units giving rise to emergent patterns – led first to the experimental setup of two-dimensional dipolar spin systems. I observed certain characteristics of complexity ranging from simple neighbor-interaction in the micro-scale to dynamic pattern formation in the macro-scale. Two-dimensional lattices of magnetic dipoles in different shapes, sizes and dimensions give a good experimental setup for studying the characteristics and abilities of magnetic force. As in classical dipolar spin systems the dipole moments are confined to rotate in the plane of the lattice. Through simple dipole-dipole interaction different complex patterns emerge when the spinning dipoles find their equilibrium configuration. We studied those phenomena using a computer simulation and a physical model. The simulation shows a two-dimensional xy system of freely rotating point dipole sources on fixed locations in square and hexagonal lattices. The dipoles are constrained to rotate in the plane of the lattice. Using the formulas for calculating the magnetic field of every neighbor and the resulting torque on the magnetic dipole, all the magnetic particles in the lattice are updated in parallel. The dipole-dipole interaction shows chain reactions and a dynamic pattern formation over time. A simulated magnetic field. The vector lengths visualize the strength of the magnetic forces. In the picture below you can see a 3×3 magnetic dipole grid. At the left, which depicts a random rotational start configuration, the pink vectors show the force of the magnetic fields of the center magnets eight neighbors. The black arrow is the sum of those vectors. The right picture shows that if the magnetic dipoles line up, then so too do the force vectors. A minimal potential energy is reached when the vector-sum of the magnetic forces of the neighbors points in the same direction as the dipole moment. The ordering of the magnetic dipoles from an initial random rotation state depends on the dipolar strength, the assumed moment of inertia, the density of the two-dimensional lattice and an added friction value. The magnetic dipoles take a long time to slow down if their dipolar strength is too high or the friction value is too low. If this is not the case, the dipoles tend to slow down into smaller domains of pattern configurations. When those domains collide they either merge into bigger domains, if they share the same pattern, or one of the domains extinguishes the other. After a while the lattice finds his equilibrium configuration. Traditionally you would assume that systems in an equilibrium condition would either be completely homogeneous or at least consist of large domains with homogeneous structures. But it occurs frequently that equilibrium states show a mesoscale heterogeneity (modulated phases, patterns, etc.) of either regular (e.g., stripes, stripe domains) or chaotic states. Based on the structure, geometry and dimension of the lattice, different patterns emerge. The magnetic dipoles self-organize into their favored equilibrium configuration. Square lattices produce micro-vortices if their dimensions are small or concentric ring formations mixed with micro-vortices, if they are larger. Hexagonal lattices produce macro-vortices if the range of interaction is not restricted to the nearest neighbors. Equilibrium states of square lattices with the size of 2×2, 4×4, 6×6, 8×8, 10×10, and 15×15 magnetic dipoles. A 10×10 square lattice starting from a random spin configuration settles down into a micro-vortex pattern. Simulations of square lattices of up to 15×15 magnetic dipoles ultimately end up in a micro-vortex pattern after starting from a random spin configuration. A micro-vortex pattern consists of 4 neighboring magnetic dipoles that line up in a circle. Due to dipole orientations micro-vortex circles next to each other are oriented in opposite directions. Those configurations have a very low local potential energy and are therefore very stable. Square lattices with sizes larger than 15×15 already start to form macro-vortices and ring structures in their equilibrium states. The results show combinations of micro-vortex patterns and concentric ring formations. Several vortex centers can appear and disappear during the simulations process before the lattice settles down in a stable configuration. Vortices are energetically favorable because in such configurations each spin is aligned along the dipolar field. Equilibrium states of square 20×20 dipole lattices starting from random spin configuration, with identical initial parameters. The vortices that appear in square lattices have centers that consist of four dipoles with their magnetic moments pointing into the same direction as you can see in the picture below. The magnetic dipoles form rings around those centers. Each ring-chain has the opposite dipolar orientation from that of the two neighboring chains. A confirmation for this behavior can be found in Stambaugh’s experiment with small hard spheres containing magnetic cores. Larger lattices, approaching infinite sizes (simulated by periodic boundary conditions), contain more vortex centers. Every vortex center becomes a crossing for 4 antiferromagnetic domains where the magnets are aligned with the horizontal or the vertical axis of the lattice. Those perpendicular aligned domains get connected on the edges with micro-vortex patterns. The picture below shows the aligned domains in white and the micro-vortex domains in grey color. The edges between those neighboring domains show smooth curved boundaries. A segment of a square lattice with color representing rotation angle. Equilibrium state of square 200×200 dipole lattice with periodic boundary conditions and random spin configuration start. A 100×100 dipole lattice starting from a random spin configuration settles down into macro-vortice patterns. The patterns that emerge from the ordering process of the dipoles are very dependent on the magnetic dipole strength. Also the dynamic characteristics of the formation process depend on the dipole strength. Considering a setup where the magnetic field vector of each dipole is only calculated from the sum of the forces of its 8 nearest neighbors, too weak and too strong dipole moments make the pattern formation more difficult. Weak dipole moments cause the dipoles to turn very slowly and to take a long time until they find a stable equilibrium. If the dipole moment is too strong the dipoles spin too fast and the never-ending feedback-loop makes it hard for the simulation to slow down in an equilibrium state. Six square 100×100 dipole lattices with rising dipole moment values from left to right. Widening the range of interactivity changes the equilibrium states of the lattice. The very ordered domains of lined up dipoles become more complex the more neighbor forces are taken into account. Testing different ranges of interactivity on a finite square lattice shows that the simplicity of the nearest-neighbor-interaction-only patterns gets destroyed. Square 50×50 lattice calculated using 8, 12, and 20 neighbors. Running the simulation on a hexagonal lattice produces aligned domains along the 3 hexagonal axes (0º, 120º, 240º), if only the 6 nearest neighbors of each magnetic dipole are taken into the calculation. As in the simulations of square lattices every line-chain has the opposite orientation of its two neighboring chains. The bigger the interactivity range is, the more neighbors are included and the more the emerging equilibrium patterns changes. When the radius of interactivity includes the 12 nearest neighbors line-domains still appear along the 3 hexagonal axes, but they are separated by bigger areas of clusters of macro-vortex centers. Hexagonal 50×50 lattice calculated using (a) 6, (b) 12, © 50, and (d) 100 neighbors, with brightness indicating dipole rotational value. It has been proven that the zero-temperature ground state of a finite two-dimensional hexagonal lattice of dipoles is a macrovortex, while the zero-temperature ground state of a finite square-packed lattice of dipoles is a microvortex. Compared to the concentric rings / macro-vortex combination that showed up in larger square lattices, the macro vortices in the hexagonal lattices don’t have a large dimension. The vortex centers are surrounded by concentric hexagonal rings around them. In contrary to the concentric rings in the square lattice, the dipole orientation of the hexagonal rings is the same. Depending on the range of interactivity there are different amounts of hexagonal rings around the centers. Lattices that include the dipole-dipole interaction of up to their 440 nearest neighbors show up to 8 concentric hexagons around their centers. Those hexagonal forms of concentric rings are located next to each other and are also flowing into each other. The brightness of the coloring indicates the rotational angle of the dipole moments. Visualizing the rotational angle of the magnetic dipoles just in two colors (above and below 180º) shows a branching line-pattern. A hexagonal 50×50 lattice with random start configuration settles down into macro vortex patterns. Detail from a section of a hexagonal 100×100 lattice calculated using approximately 440 nearest neighbors. Hexagonal 100×100 lattice calculated using approximately 50 nearest neighbors. A simple two-dimensional model of freely rotating magnets on fixed positions was setup. 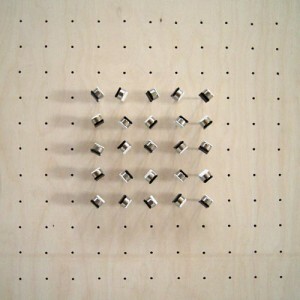 The experimental model setup consists of a board with holes along a 2.5×2.5 cm grid. Cylindrical permanent magnets were put into little holders on needles and were able to rotate freely in their holes. We used magnets made of NdFeB N35, with a Ni-Cu-Ni surface, a maximal magnetic energy-density of 263-287 kJ/m², the ability to lift up to 3.5 kg and a size of 1 cm x 0.5 cm (The magnets were purchased online at powermagnetshop.de). 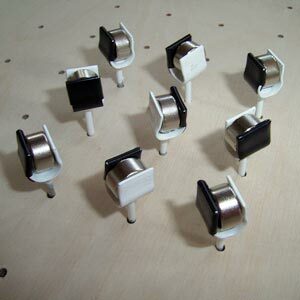 When the magnets are put in their holders, the holders immediately rotate according to the magnetic fields of their neighbors. The resulting configurations show the same patterns as a similar system of point dipoles simulated on the computer. The rotating magnets line up in micro-vortex circles. The model also shows the alternating orientation of neighboring micro-vortex circles. Square lattices of 2x$2, 3×3, and 5×5 exhibiting micro-vortex patterns. Try the Dipole Spin System Processing applet. Or see more videos at the Dipole Spin System vimeo album and more images at the Dipole Spin System flickr set. Posted in Home, Projects and tagged 2006, applet, magnets, pattern formation, processing.